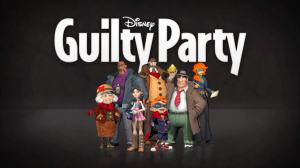 Disney Guilty Party is a fun and hilarious mystery party game, exclusively for Wii. Friends and family play as the savvy sleuths of the world-famous Dickens Detective Agency and use the Wii Remote as their detective tool to investigate mystery locations, sleuth for clues and grill suspects. Gather enough evidence to identify the culprit and catch the guilty party! Disney’s Guilty Party received a Metacritic score of 78. The highest score of any Disney Wii game.